Christmas is around the corner and only when you start decorating your house with all the beautiful and warm decorations, home feels ready to welcome something great as Christmas and we start getting into the holiday spirit. If you are not up for the same monotonous decorations that you do every year and want to try something new this year, then we have got you covered. We have listed down a collection of jaw-dropping and super inspiring Christmas decorations for your home decor. 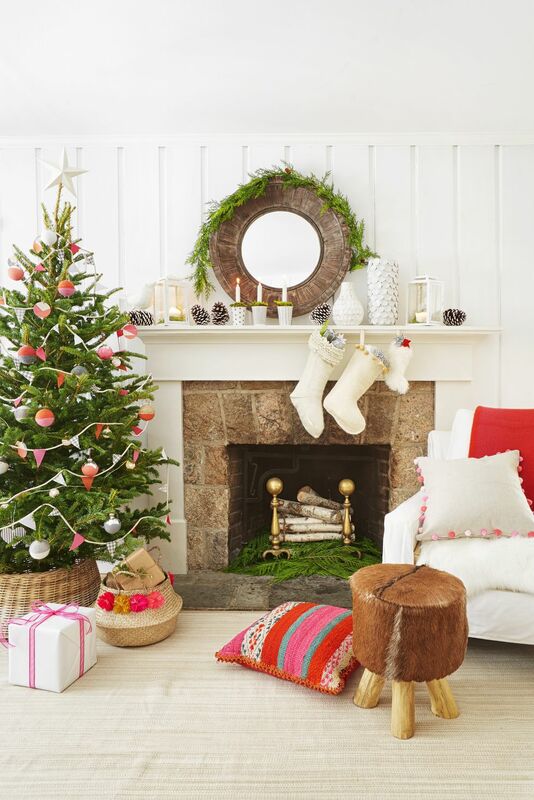 Everyone loves Christmas and if you have a small space, space should not stop you from getting into the holiday vibes. Felt, a fabric pencil, pearl embellishments, red ribbon, and a hot glue gun is all you need for making your very own mistletoe. You can simply cut out your desired shaped mistletoe and decorate with pearls and red ribbon. Hand the mistletoe outside or inside your living room to add a little romance. If you have some vintage car ornaments lying and rusting in the house, bring them out and make some snow globe jars which are very retro and attractive. Fill up the jars with fake snow or cotton or Epsom salt which would look like a snow and add your car ornament with maybe a tiny tree depending upon the size of your jar. Put these vintage snow globe jars at the kitchen top or living room. You just need to take a small tree, living or artificial that depends upon you and then place it inside a wired basket. Light up the tree and the basket with fairy lights and keep it in the corner of your room. This will give you the rustic farmhouse look instantly. Mason jars are the most loved center-piece. You can create one for yourself as well. Just paint the jars red or white or a combination of both and add candles. 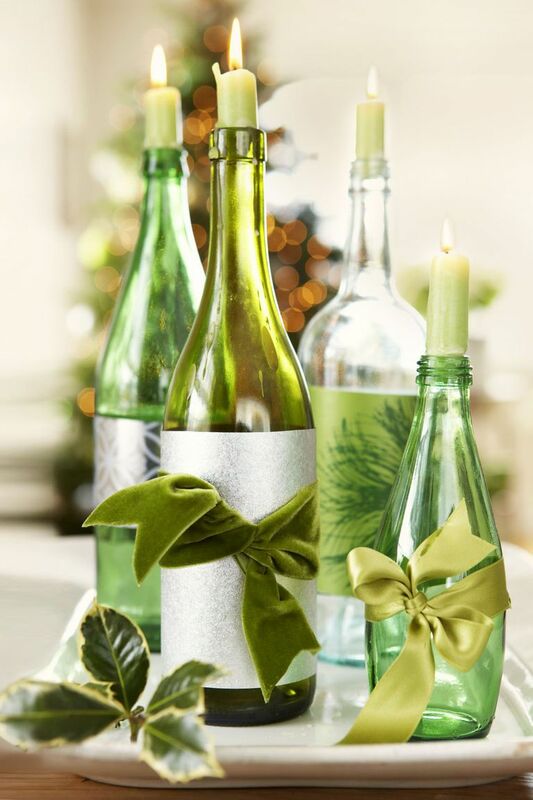 Keep it on your dining table which will look like a welcoming and festive vibe. 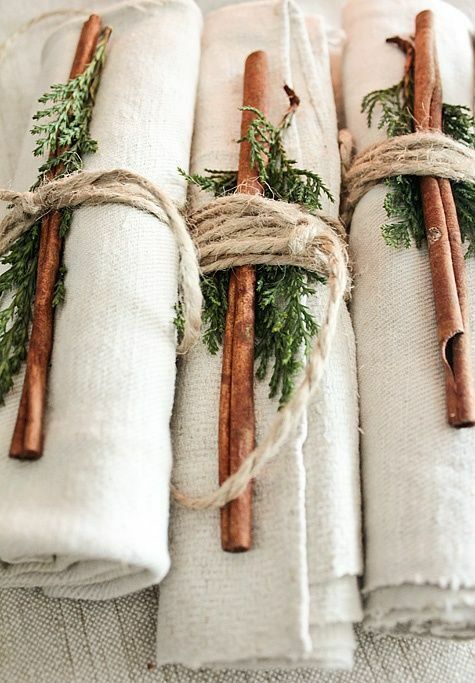 Linen napkins are decorated perfectly for the holidays with the cinnamon stick and just a sprig of evergreen is the look that everyone will talk about. The cinnamon used to decorate the napkins will make your table smell amazing. You can decorate a ladder and use it as a Christmas tree. Wrap some fairy lights around it and add embellishments according to your wish and choice. The ladder Christmas tree brings in some country vibes. 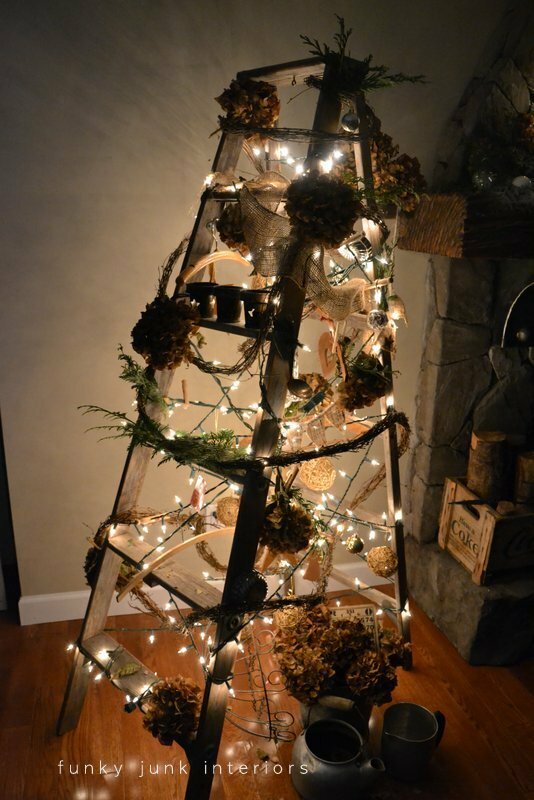 This light up Christmas ladder can add a little rustic look to your home decor. 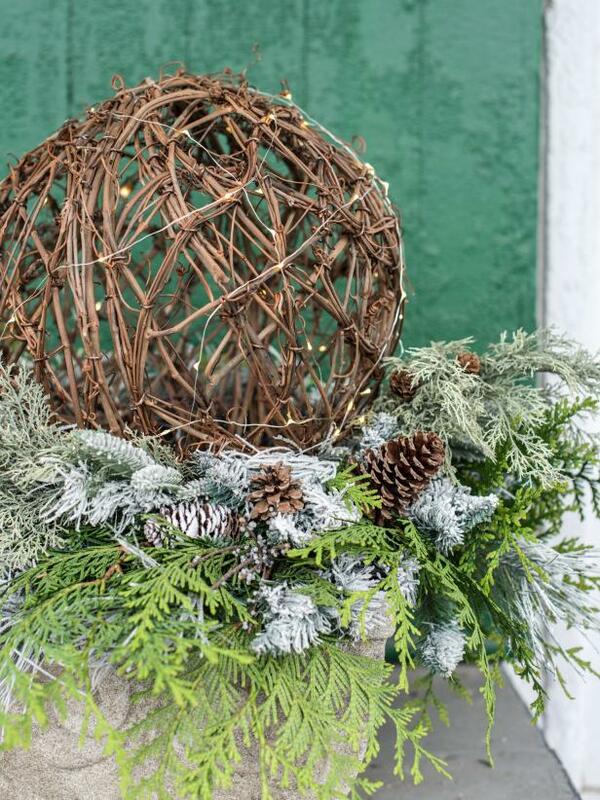 To make a simple and attractive grapevine sphere all you need is 2)12’ grapevine spheres, 2 to 4 strands of waterproof LED fairy lights, 2 urns or planters, 2 live or artificial evergreen wreaths, pine cones, hot glue gun, florist wire. Start with wrapping one or two waterproof LED lights around the large grapevine sphere and make sure you pack the battery so that it can easily rest inside the urn. Make sure the battery is at a reachable distance to switch it off or on. Wrap the end of the light wire around the grapevine brand to secure. You can use these at your porch and decorate it with some pine cones. One thing that attracts the people or guests are the decorations and Christmas is the time of decorations. 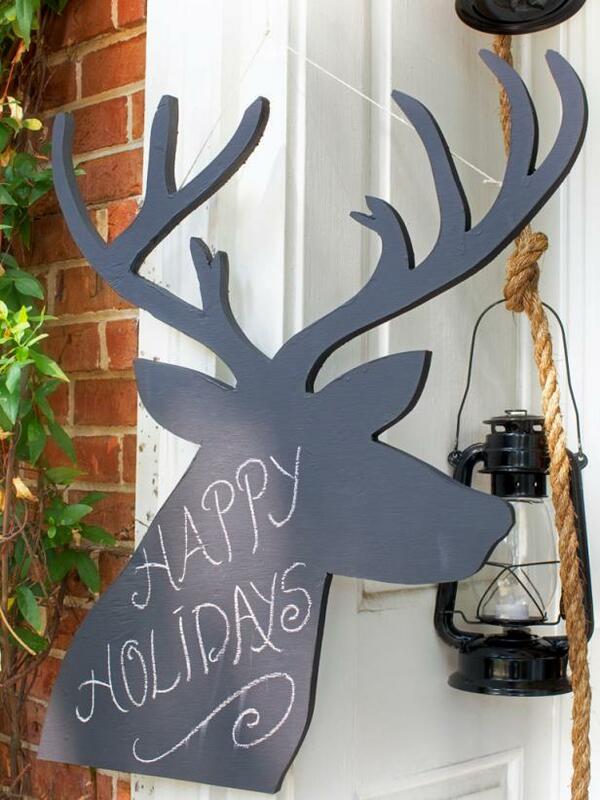 So trace a reindeer silhouette onto your desired size of plywood. Cut it out with a jigsaw and apply two coats of chalkboard paint. Add screws eyes and wire to the back so you can display your finished sign either outdoors or indoor. If you’re planning to decorate your front door with some Christmas decorations but you’re not a fan of same old boring decorations then this unique wreath is the thing that will amaze you. All you have to do is coat a ceiling medallion in green high gloss paint. When it dries, loop through some colorful holiday ribbon and hang it by your front door. Do you want to build a snowman without snow? 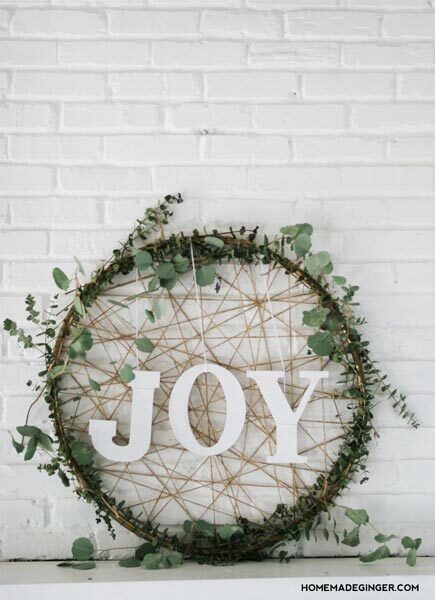 Take a sturdy wooden support plus 3 faux evergreen wreath is all you’ll need to build a snowman. Set up a sturdy wooden support into the ground and sink 1X2 pressure-treated lumber up to 6 inches. Then layout the wreaths in a proper snowman figure ie make sure of the proportions of the wreaths you’ll buy. Starting from the bottom, with the help of the screw fit all the wreaths on the wooden support and wire them up for extra safety. Before you proceed, make sure the wreaths are at an equal distance and the snowman looks like a snowman. 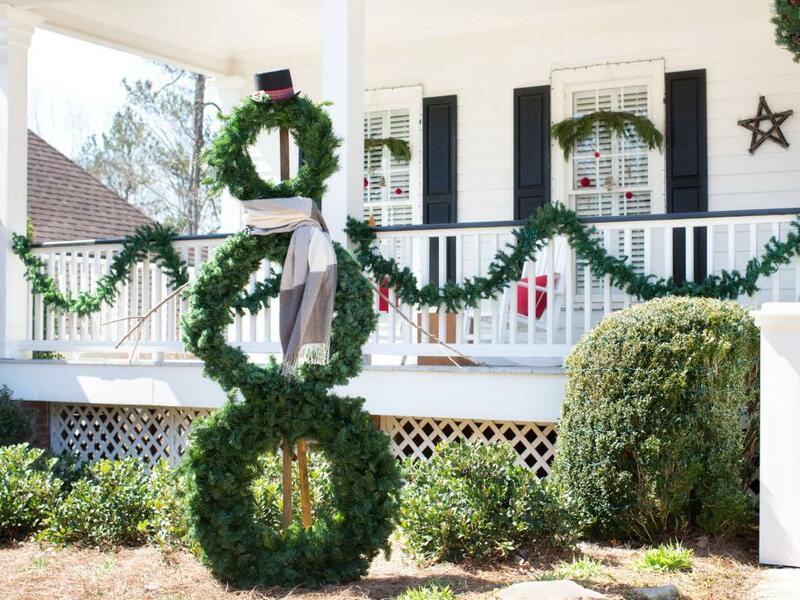 You can add embellishments like branches, scarf, top hat to complete the snowman. Create a warm and welcoming atmosphere for the guests or even for you. All you have to do is fill up the mason jars with Epsom salt because they look like snow, then add a small votive candle and line the walkway leading to your door. 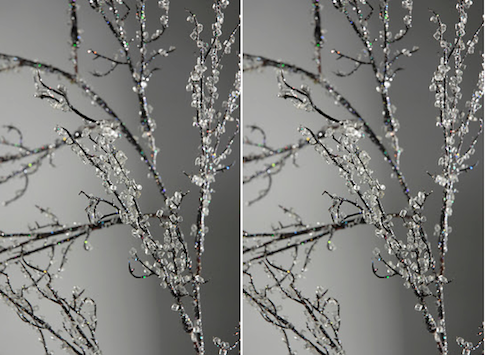 You can add diamond filer willow branches to update your home decor for Christmas. These frozen branches look like actual snow is falling. Why should the windows feel left out? 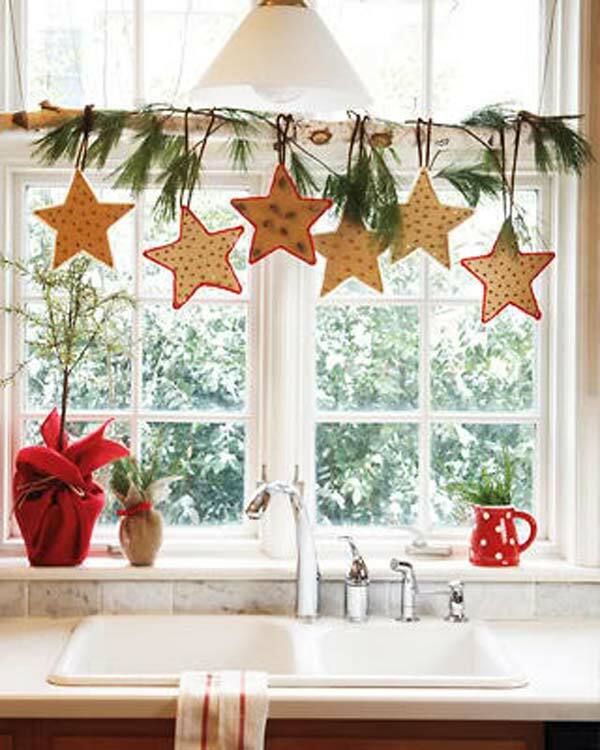 Cut out freehand stars out of the cardboard and poke cloves through one star for an affordable, natural air freshener. 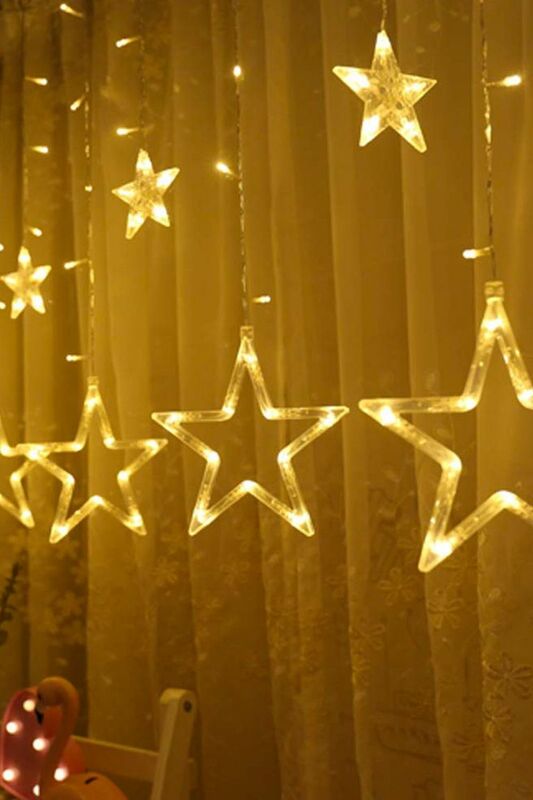 Decorate your curtains along with star fairy lights for the Christmas vibes. Who said you can’t decorate your home with the unconventional color scheme? Sure get creative and use colors like black, yellow, white, olive green etc to decorate the home with Christmas tree cuttings, wreath and dining set. Take a stroll around the city for some inspiration about the decor. Hang in the Christmas ornaments on the ceiling or on the chandelier with some wreath around it. 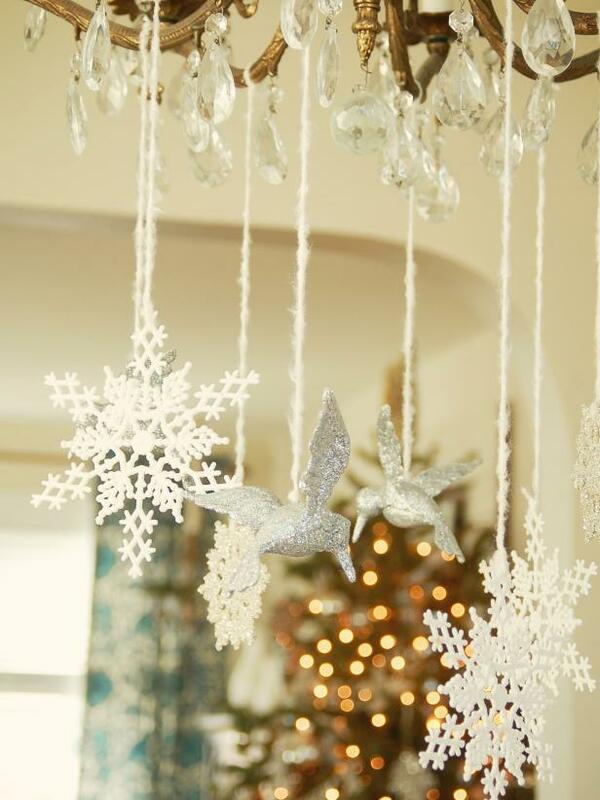 You can also add ornaments like glittered birds and plastic snowflakes to give the house a whimsical touch. It may or may not snow at your place but if Christmas is around the corner, you have to make It seem like snow happened. 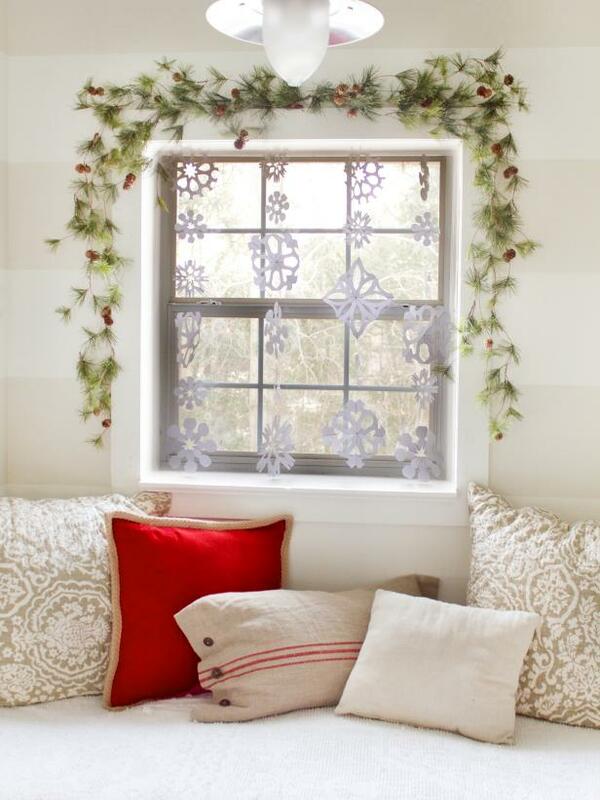 You can decorate your windows with white copy paper and printable snowflakes and string them together to hang in. In this way, you can give your window some snowy effect. Also, make sure you choose the right kind of pillow covers for the window seating. 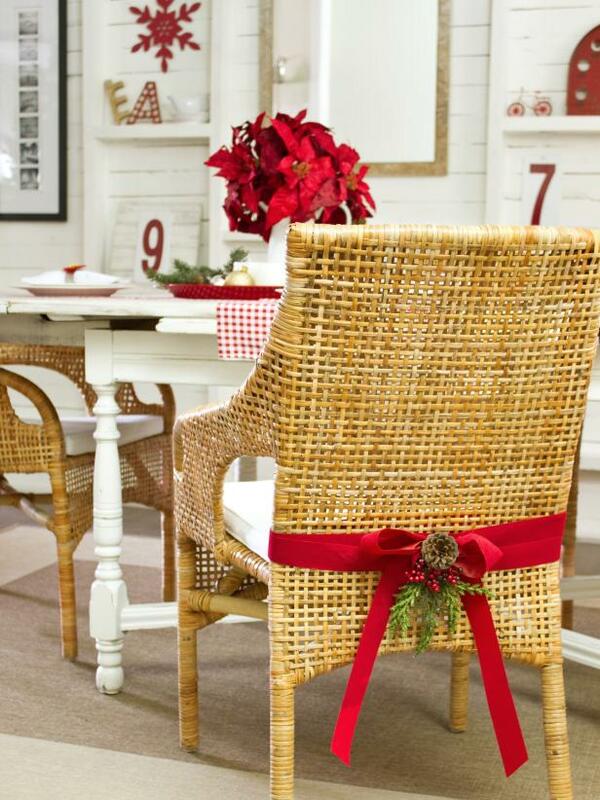 Creative festive dining chair embellishments to coordinate with your tabletop decor is a very apt idea. Wrap and tie the two-loop bow in the center of each chair using two-inch-wide un-wired ribbon in your preferred seasonal hue. You can add your choice of embellishment at the center of each bow with greenery, pine cones or berries. Make charming stockings for the family with pieces of drop cloth and other Christmas decorations like bells and leaves to spice up your home decor this holiday season. If you’re feeling to celebrate white Christmas this year, try using all white decorations on your mantel including the white garland. Use a washable paint marker to add fluttery flakes to a mirror. Festive stockings attached to faux garland and a tassel basket to hold plenty of goodies. 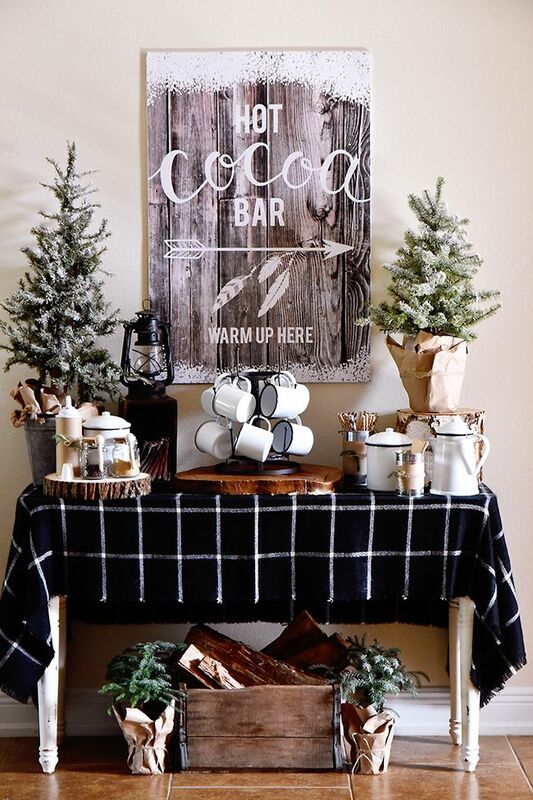 Go creative with your bar cart this holiday season and give it a seasonal makeover with tabletop trees, a customized wood sign, cute cups and an assortment of warm beverages. Wrap your books with the leftover wrapping paper for pretty spines or swap in wintry prints and festive figurines. You have pine garlands, wreaths and well basically everything that you can have for Christmas decoration. So adding up another type of evergreen seems like a great idea eh? 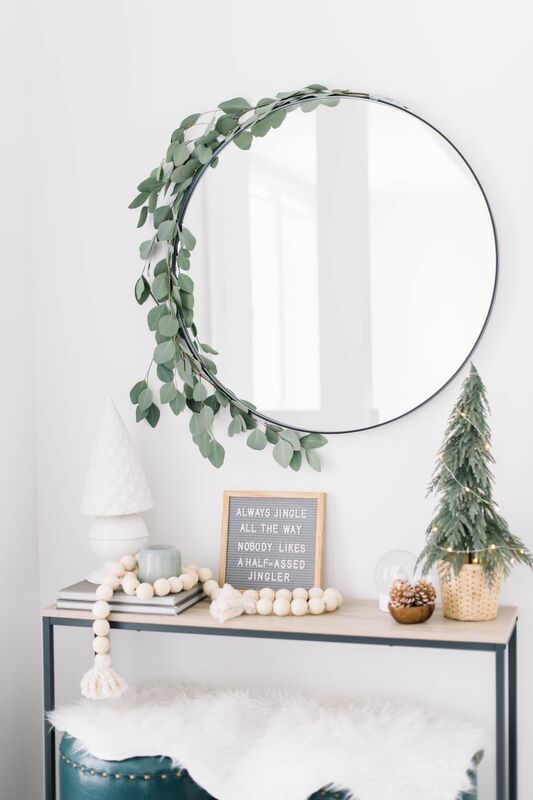 Add Eucalyptus accents into your home decor for the holiday season vibes. You can add up a pile of birch logs and add a few sprigs of green to make them out of use fireplace like a fake fire. This might give your home a warm-up look. 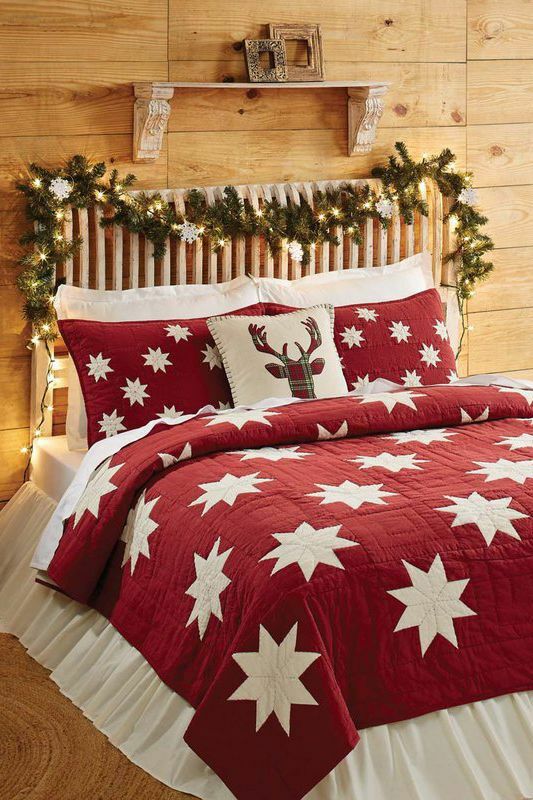 Getting out of bed on winter mornings just got even harder thanks to the cozy and Christmasy quilt. Don’t forget the matching shams. Spray-paint the hula hoop gold and use twine to create patterns inside the hula hoop. You can add embellishments according to your choice. 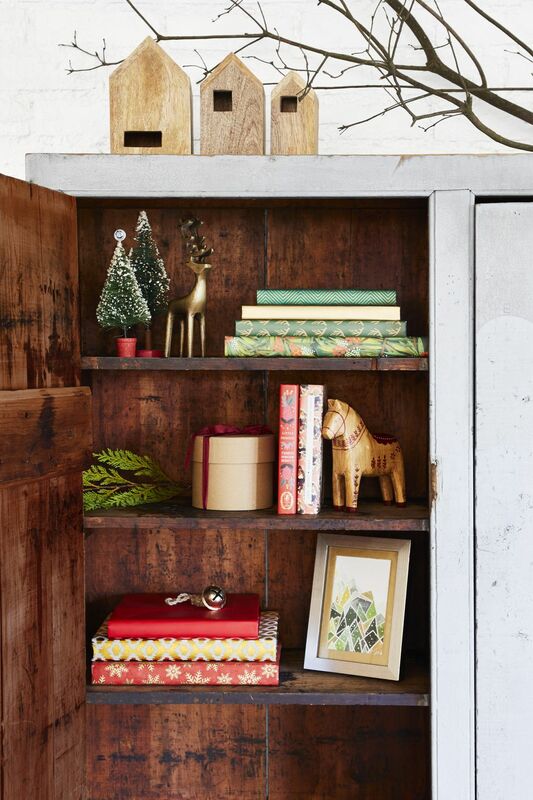 Make a Christmas shelving with smooth wooden boards to hold this holiday season’s presents. Spread Christmas cheer by greeting your guests with bright coloured arrangements of seasonal paper white. Paper white belongs to the daffodil family and will flower indoors at any time of the year. Just place the paper white bulb in enough water to cover the lower portion of the bulb. After they bloom in a month, place them in a cool spot out of direct sunlight. You can arrange them with heather, juniper and moss and hang it directly on your front door. So with all the mentioned super-inspiring ideas for Christmas decoration ideas, get ready to throw some snow and glitter onto your house. Gather all your decorations including the garland and twinkle lights and get ready for Christmas!! Don’t forget to take a snap of the beautiful decorations and share.